1. Drill 9/32" hole in mat backing 3-3/4" from center of tee in direction DrivePoint device will be installed. 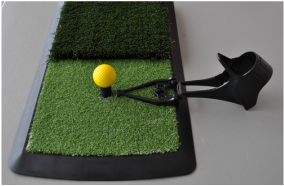 Rubber-backed mats are typically firm enough for standalone installation. Foam-backed mats may require addition of wood or other firm material as a secondary backing. 2. 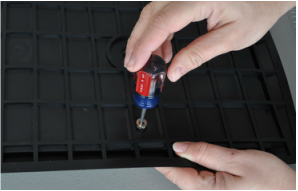 Push anchor into drilled hole and install flush with hex wrench or flathead screwdriver. 3. Position center of algnment arc at tee and fasten device through mounting slot with thumbscrew. Do not overtighten thumbscrew. Thumbscrew may need to be trimmed to ensure mat lays flat. ​4. 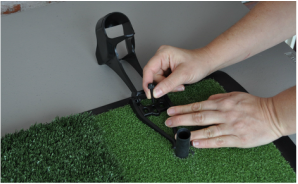 If device does n​ot properly tee ball, adjust distance between device and tee. For lower tees (less than 1.5"), move device away from tee. For higher tees (above 2.0'), move device towards tee.